Image caption GMP said it recognises it has "a way to go to reassure communities"
Some police forces closed almost half of hate crime investigations last year without identifying a suspect, according to official figures. The Home Office found Greater Manchester Police (GMP) fared the worst in England and Wales - shutting 46% of cases with no-one in the frame. West Midlands Police (WMP) had the second highest number with 44%. GMP said it recognised it has "a way to go to reassure communities". WMP said it was determined to "trace suspects". The hate crime offences include racially or religiously aggravated assault, harassment and criminal damage. The figures released related to offences from September 2017 until September last year. 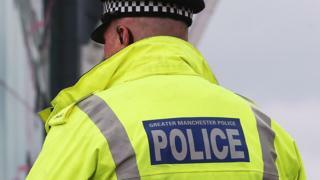 GMP - which had more than 5000 recorded offences during that period - acknowledged it had "a lot of work to do" to ensure hate crimes were dealt with "in the best ways that we can". West Midlands Police said it was determined to follow "all active lines of inquiry to trace suspects". It recorded 3,405 offences last year. Other forces closed around a third of cases, including British Transport Police with 37%, Northumbria 33% and Sussex 31%. Northumbria Police said it worked "extremely hard" to give victims the confidence to come forward and had seen a "significant improvement" in how it recorded hate crime, while Sussex Police said it rated highly among other forces in achieving successful outcomes for hate crimes reaching court. The total number of offences recorded by police has reached a new high, with 57,652 recorded during the period across England and Wales since hate crime was established in April 2012. The Equality and Human Rights Commission said the figures were "disappointing", saying victims of these offences are reluctant to report incidents "as they feel that the police won't take the incident seriously or have the power to act". The National Police Chiefs' Council (NPCC) said while any rise in hate crime was concerning, the latest figures also reflected success in improving the reporting of such offences.